Although not one of the biggest characters in Jungle Junction, Hippobus is easily one of the most recognisable and loveable! 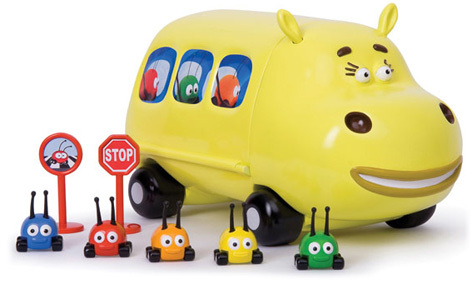 She's a cross between a hippopotamus and a bus and is responsible for transporting the Beetlebugs to and from school. 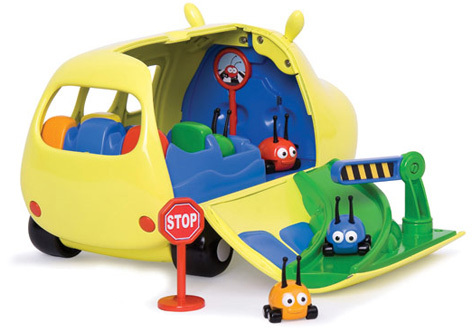 This Jungle Junction Hippobus Playset features a folding side that converts into a ramp for letting the Beetlebugs slide safely out onto the floor. With a broad Jamaican accent and bright yellow paintwork, she converts brilliantly into this Hippobus toy, as well as making an appearance in some of the show's other playsets and character packs. Please tell us what you think of the Jungle Junction Hippobus Playset by Jungle Junction and Flair.